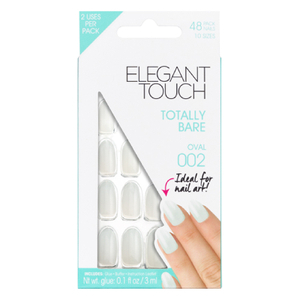 Be creative with your manicure using the Elegant Touch Totally Bare Nails - Coffin. Arriving in a bare, clear hue, the false nails make the perfect blank canvas, allowing you to create your own unique look. The coffin shaped nails can be decorated before application, making it incredibly easy to achieve a flawless finish. Whether decorating with nail polish or nail art, the false nails deliver a longer lasting finish due to the lack of moisture in comparison to the natural nail. The nails arrive in ten different sizes, which ensures they fit comfortably, whatever the size and shape of your own nails. Expect a long wearing manicure, with stunning results. To Apply: Paint the false nails as desired before application. Prep natural nails with polish remover. Buff and file. Select correct nail sizes. Apply glue to nail and apply the nail from the cuticle. Press down. To Remove: Buff nail. Prepare cotton pad and foil. Wipe away residue. Save 20% on Elegant Touch. Discount has already been taken from RRP. Offer valid for a limited time only. These nails are excellent.They are a perfect shape, quite good length although I wouldn't want them any longer and really easy to paint.Would definitely recommend and repurchase.